The Good: The Google Pixelbook has a sleek convertible design. Its sharp touchscreen is bright and colorful. Performance is fast, lag-free and smooth. The dedicated Google Assistant button is useful. The Bad: It’s expensive. The stylus is sold separately. It has the same built-in limitations as other Chrome OS systems. The Bottom Line: The Pixelbook has high-end hardware and a great hybrid design, but it’s still hard to justify spending so much on a Chrome OS laptop. Chromebooks have a reputation for being cheap — both in cost and construction. However, a handful of premium models have always challenged that preconception, from Samsung’s Chromebook Pro ($499.00 at Amazon.com) and HP’s Chromebook 13, to Google’s own Chromebook Pixel models. 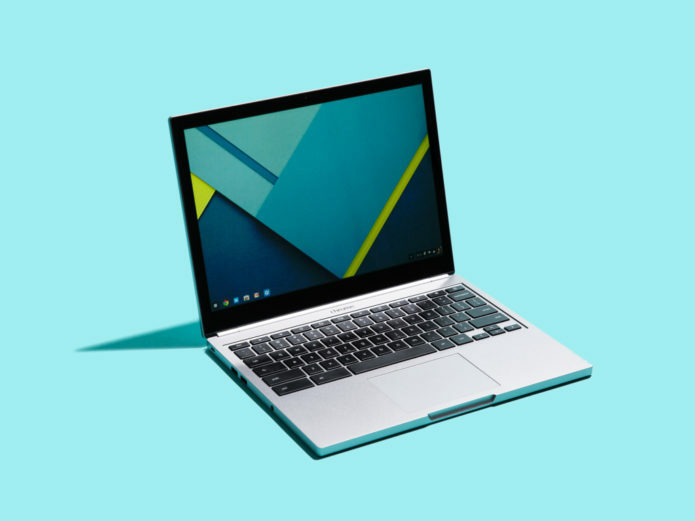 Recasting its flagship Chrome OS device as a two-in-one hybrid, Google is positioning the new Pixelbook ($999.00 at Amazon.com) as the top of the Chromebook food chain. The mostly metal Pixelbook is a great everyday work machine for those heavily dependent on Google’s suite of apps. Like most modern Chromebooks, it also has access to the Google Play store, meaning it can download and use a wide range of apps, just like an Android phone or tablet. The laptop’s useful convertible design, which can be propped up like a tent, flipped over like a stand or folded back like a tablet, adds to the overall usability and utility. The Pixelbook ups the ante for all Chromebooks, and it does so at a high cost — literally. The laptop starts at $999 (£999), which is almost double that of the Samsung Chromebook, previously one of the most high-end Chromebooks around. The review unit we tested had a 7th gen Intel Core i5 CPU, 256GB of storage and 8GB of RAM. To be fair, Google’s earlier attempt at a premium Chrome OS system, the Chromebook Pixel ($579.00 at Amazon.com), cost even more at launch. There is no official Australian pricing or availability yet, but the price converts to about AU$1,275. Google Assistant has its own dedicated button on the Pixelbook’s keyboard. It’s on the bottom left corner, located in-between the ctrl and alt buttons, and pressing it launches Google Assistant. After pressing the Google Assistant button, you can then type out what you’d like to search. Google Assistant can also analyze your screen as soon as it launches and offer popular search results based on what you’re looking at, similar to Android phones. Google Assistant can also be summoned by saying “OK Google” out loud. It understands voice searches, but don’t expect the Pixelbook to replace a Google Home($129.00 at Dell Home) because you can’t just summon the assistant and talk to it like a smart home speaker. The Google Pixelbook Pen is a stylus that works with Google Assistant. It’s closer in design to the Microsoft Surface Pen than the Apple Pencil, doesn’t require pairing or a Bluetooth connection and currently only works with the Pixelbook. Like the Pixelbook’s keyboard, the Pixelbook Pen has its own Google Assistant button. It’s the only button on the stylus. It works by pressing it once then using the stylus to circle anything on the screen. Google Assistant then searches whatever’s inside the circle, whether it be a photo of a popular landmarks or text in an article. I found the image search function to be quick and handy, but the text search needs some improvement. It was only useful when searching one word or very specific terms. Otherwise, the Pixelbook Pen was a comfortable stylus for navigating the touchscreen, as well as writing down notes. Unfortunately, there’s nowhere to store the pen on the laptop. For people who often lose things like me, that can tack on the extra cost of a pen clip. Samsung’s Chromebook Pro, in contrast, has a built-in stylus slot. No longer is Chrome OS an odd operating system that’s practically useless without Wi-Fi (although it’s still limited in its offline capabilities compared to a windows or MacOS computer). Chrome OS is still mostly centered around the Chrome web browser, but now the Google Play store is available on the newest version, allowing you to download, install and run millions of Android apps, just like an Android phone or tablet. Android apps on the Pixelbook can be dynamically resized like any regular window. They favor the same dimensions as they do on a phone. App windows are moveable when using the Pixelbook as a laptop, however, apps only work in full-screen mode when in tablet mode. Most new Chromebooks can use Google Play apps. Performance, especially for games, depends on the device’s processing and graphics capabilities. And if you’re thinking adding the free-for-all of Android apps to the previously very secure Chrome OS environment is a potential issue, you’re right. Fortunately, the Android apps run in their own walled garden, separate from the main Chrome OS, so the security issues are at least minimized. At a little over 10mm thick and weighing just under two and a half pounds, the Pixelbook is a striking laptop that looks and feels well-built. It’s fashionably thin, fanless and functionally portable. The minimal design culminates in the classy glass panel on the back of the screen that resembles Google’s Pixel phones. Its convertible design is useful: I easily went from using the keyboard to respond to an email, to folding it into a tablet so I could easily read an article. The screen was quick to respond and flip when switching from one configuration to another. The backlit keyboard, which has 0.8mm of key travel, is quiet and comfortable to type on. It has silicone pads on the keyboard deck that are pleasantly comfortable to rest wrists and palms on. It also gives the device some grip when used as a tablet or propped up like a stand. In addition to the aforementioned Google Assistant key, there are a few other buttons on the keyboard that you won’t find on other laptops. Instead of a caps lock key on the left side, it has a search key for searching your device or Google. There’s also a button on the top right corner of the keyboard that looks like three short lines stacked on top of each other. It launches the system menu that shows info like Wi-Fi network connection and volume level. The Google Pixelbook performs the way you’d expect a high-end laptop to perform. It’s lag-free, zippy and smooth. Even with multiple apps open at the same time and more than a dozen tabs open in Chrome, including a streaming HD video, the Pixelbook chugged along as if nothing was happening. The entry-level model has 128GB of storage space, which is a lot more than the 16GB or 32GB of drive space usually found in Chromebooks. The increase in space allows users to save their files on the laptop while giving them plenty of space to download apps and Netflix videos for offline viewing. The Pixelbook has a square-ish shape that’s rather distinct, due to its screen’s 3:2 aspect ratio. The screen is very bright and has wide viewing angles. I could clearly see it outdoors on a sunny day, despite unavoidable glare. The laptop worked well for watching TV and movies, however I found the speakers a bit low in volume. I preferred connecting to my Bluetooth speaker or headphones to the Pixelbook instead. Google claims that the Pixelbook can last 10 hours on a single full charge. With heavy use (working in a Google Doc, streaming videos, running multiple apps) the laptop lasted me about 6 hours. In our streaming video tests, it lasted 9 hours. Not all Chromebooks have to be simple and cheap. They can also be powerful and chic, and the Pixelbook is the leading example. If your computer activity revolves around using a browser, the Google Pixelbook is great notebook for work or school. It’s also good for personal sctivities such as watching movies and sketching. Still, it’s difficult to justify the Pixelbook’s price when cheaper, capable Chromebooks exist. For example, Samsung’s Chromebook Pro has a high-res screen, comes with a stylus, 360-degree hinge and has access to Android apps, all for about half the price. And while the Google Play store continues to grow, the support for Android apps on devices with large screens is still lacking. And if you’re comfortable spending this much on a new laptop, high-design examples like the Dell XPS 13 ($1,699.99 at Dell, Inc.) or HP Spectre ($1,199.00 at Amazon.com) can be configured around the same price with similar specs, plus access to the endless world of Windows apps, including programs like Photoshop or Premiere that require Windows or MacOS to run. The Google Pixelbook makes a case for high-performance Chromebooks, but its power and beauty come at a price that requires a leap of Chrome OS faith.